This is a review of the naturehike nh17a012-b packable 18L backpack. The nice people at banggood were kind enough to send me a sample to review. The first thing you’ll notice about this bag is that it is strikingly similar to the Matador packable backpack. This one however is just a fraction of the price and still feels very well made. Speaking of the price, this bag is currently about AUD$22 (USD$16). The Matador bag is about AUD$70 (USD$50). This naturehike bag has water resistant zippers and a durable water resistant nylon construction. And although the inner seams are not tape sealed but it is very water resistant. It also features two mesh bottle pockets on each side and an extra pocket on the front. The straps of this bag are made of a mesh material that make it more breathable and lightweight. They make the bag very comfortable to wear even with a heavy load. The 18L capacity is quite spacious too. I could easily pack enough for a weekend in here or enough for a long hike. The only real downside is that there’s no padding on the back of the bag, so you’ll have to pack the bag in a way that will make it comfortable against your back. My only other nitpick about the bag is that the zips are slightly firm. They don’t slide open and closed as easily as I would like. But overall I do like the water resistant zip and the bags overall design is really nice. It’s going to replace my SeatoSummit daypack for sure. It may even become my daily commuting bag. 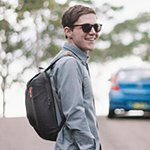 I’d definitely recommend checking this bag out especially if you’ve been put off by the Matador bags pricing.